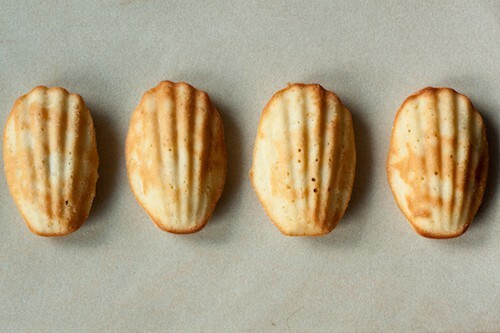 Marcel Proust's Madeleines | Good. Food. Stories. In Marcel Proust’s À la recherche du temps perdu (Remembrance of Things Past, or more recently translated as In Search of Lost Time ) the taste of a madeleine dipped in tea famously brings an ocean of memories crashing down on the narrator. Proust’s stream of consciousness gets at the possibilities not only of modernist prose, but of food’s ability to conjure the ghosts of the past in the present. The smell of a pot simmering on the stove can put us in mind of the long-ago afternoon spent perfecting the recipe with a friend; the taste of bread fresh out of the oven makes us feel like the grandmother who taught us to bake it is with us still. Because food is taste, smell, touch, and sometimes even sound, its powers of conjuration are especially powerful. The first time I ever tried a madeleine was at a tea shop in Ann Arbor, Michigan. It was a rainy autumn day and the air smelled of rotting leaves. I was meeting a friend and felt very grown up. I was fifteen. I had no idea what madeleines were, but I loved the name—like Madeline , one of my favorite picture books—and thought the seashell shape was beautiful. When I bit into the first one, it was gummy and oversweet and, unlike the narrator in À la recherche, dipping it in my tea did nothing except coat the top of the liquid with an oily lemon fingerprint. But they were French and beautiful, so of course I pretended that I liked them, just as I’d pretended I knew what I was ordering. I didn’t taste another madeleine for a long time; not until I made them three years ago after I found a beautiful mini-madeleine pan at a garage sale in Bloomington, Indiana. The lemony smell of them baking reminded me of the plastic tub of lemon frosting I requested on my birthday cake the year I was eight, and I was sure they would turn out badly, like the ones I’d had so many years before. Even these, though, were pleasant memories—tea with a friend; the sticky sweetness of the lemon cake that no one else in my family could stand to eat, leaving it all for me. To my surprise, my madeleines were light and delicate, more cakey than the ones I’m sure had sat for days in the teashop’s dusty counter, and less sweet. So, as exaggerated as Proust’s meditation may be, and as much of a pop culture cliché as his madeleines have become, it’s never a bad thing to luxuriate with food, letting faded memories gain strength as we eat. “And as soon as I had recognized the taste of the piece of madeleine soaked in her decoction of lime-blossom which my aunt used to give me (although I did not yet know and must long postpone the discovery of why this memory made me so happy) immediately the old grey house upon the street, where her room was, rose up like a stage set to attach itself to the little pavilion opening on to the garden which had been built out behind it for my parents (the isolated segment which until that moment had been all that I could see); and with the house the town, from morning to night and in all weathers, the Square where I used to be sent before lunch, the streets along which I used to run errands, the country roads we took when it was fine” (À la recherche du temps perdu). Brown the butter by melting it in a small saucepan over medium-low heat and continuing to cook until the butter separates. The white solid bits that initially rise to the top of the liquid will fall to the bottom of the pan and start to brown, while the liquid will turn deeper golden and begin to smell gorgeously nutty. When this happens, remove the pan from the heat—you’re going for a very light brown here; make sure not to burn. If you’re greasing your madeleine pans with butter, spoon 2 tablespoons of the melted butter into a prep bowl and set aside. In a medium bowl, whisk the flour, sugar, and salt together. In a separate bowl, whisk the eggs, vanilla, lemon juice, and lemon zest together until the liquid is slightly foamy. Pour the egg mixture into the flour mixture, and stir with a silicone spatula until just combined. Add the 8 tablespoons brown butter and gently but persistently fold it into the batter to incorporate. At first it will look like too much butter, but it will integrate. Stop stirring when it does. When you’re ready to bake your madeleines, preheat the oven to 350°F and take your batter and pans from the cold. Fill each shell in the madeleine pan with about 1 tablespoon of the batter for a standard madeleine pan, and 1 teaspoon if you’re using a mini-madeleine pan. If you overfill them, the batter will spread and you’ll get a little halo around the shell shape, which is not traditional, but I think looks kind of like a pretty frame. Bake for 8-10 minutes and then rotate pans to assure even browning. Bake for another 2-5 minutes, watching carefully to determine doneness—mini madeleines may only need 10 minutes total, depending on your oven. Your madeleines are ready when the edges are browned and the middle feels firm and springy to the touch. Let your madeleines cool for a minute or two before using the tip of a knife to lift them gently from the pan. If you’d like, once they’re cool, dust them lightly with powdered sugar. Repeat with the remaining batter. 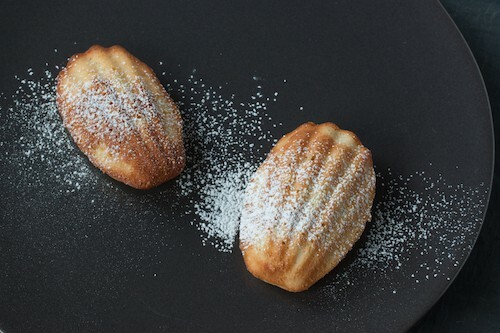 Madeleines will keep for up to 3 days in an airtight container, but they taste best when eaten within a day.